In 4-quart saucepan, melt 2 tablespoons of the butter over medium-high heat. Add mushrooms; cook 4 to 6 minutes, stirring occasionally, until browned. Add 2 tablespoons of the butter, the onion and carrots; cook 4 to 6 minutes longer or until vegetables are just tender. Add flour; cook and stir about 1 minute or until mixture is coated and flour begins to brown. Beat in chicken broth and milk. Cook and stir 3 to 4 minutes or until thick and bubbly. Add potato cubes; cook 5 minutes. Stir in chicken, asparagus, 2 tablespoons of the parsley, 1 teaspoon of the thyme, and the salt and pepper. Cook 2 to 4 minutes or until potatoes are tender and mixture is hot. Pour into baking dish. Evenly place biscuit pieces on top. Bake 12 to 16 minutes or until biscuits are golden brown and cooked through. In 1-quart saucepan, melt remaining 2 tablespoons butter over low heat. Remove from heat; stir in remaining 1 tablespoon parsley and 1/2 teaspoon thyme. Brush biscuits with herbed butter. To freeze: Line 13x9-inch (3-quart) glass baking dish with plastic wrap, leaving enough overhang to completely enclose assembled pot pie filling. Cool filling completely in shallow pan, covered, 1 hour in refrigerator. Pour cooled pot pie filling into dish; cover with another layer of plastic wrap. Freeze pot pie filling about 8 hours or until completely frozen. Transfer frozen pot pie filling to labeled 2-gallon resealable freezer plastic bag. Remove air; seal and freeze up to three months. To bake: Remove plastic wrap; transfer to 13x9-inch (3-quart) glass baking dish sprayed with cooking spray. Cover tightly with foil; thaw in refrigerator up to 48 hours or until completely thawed. Bake, covered, at 400°F about 40 minutes or until filling is hot (165°F in center). Uncover; stir mixture, and place biscuit pieces on top. Bake 12 to 16 minutes or until biscuits are golden brown and cooked through. In 1-quart saucepan, melt remaining 2 tablespoons butter over low heat. Remove from heat; stir in remaining 1 tablespoon parsley and 1/2 teaspoon thyme. Brush biscuits with herbed butter. Wild mushrooms can be substituted for the white button mushrooms, making this dish a bit more elegant. 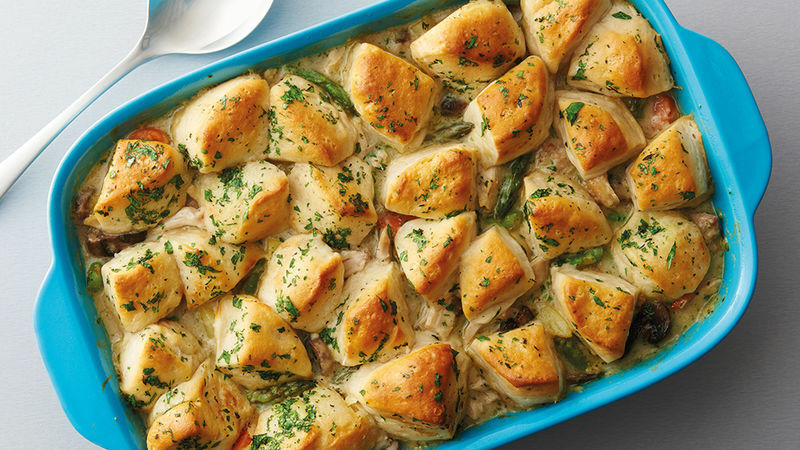 Substituting cooked turkey for the chicken, and green beans for the asparagus makes this dish perfect for transforming any Thanksgiving leftovers.